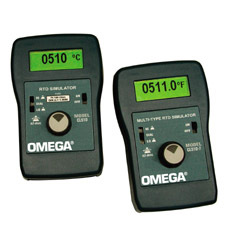 The OMEGA™ CL510 and CL510-7 RTD Simulators simulate standard RTD curves over the entire industrial temperature range. Choose between seven standard RTD curves. The CL510 Series will simulate RTD resistances into all types of instruments such as transmitters, recorders, controllers, alarms, data acquisition, and computer systems. Rest easy knowing these calibrators are compatible with pulsed systems and transmitters. The EZ-Check function allows the user to store three output temperatures for real convenience. All settings are saved with the power off. 참고: Each unit comes with NIST certification (without test point), manual and 9V battery.